Being from the tropical zone it should not surprise you that banana is an integral part of our cuisine. Every part of a banana plant is used. The flower, fruit and the inner stem is all consumed and the leaves on festive occasions are used to serve food in. The leaf is sometimes also used to wrap the food in to add flavor. I think it’s a practical way of life having banana plants in abundance. The sautéed banana that’s being shared today is a common side dish for rice. Like most of the thoran this is also made with the same ingredients. The only differences probably being the cooking time for the vegetable. Once you understand how long to cook a particular vegetable without it getting overdone you can do thoran with a variety of vegetables. I hope you enjoy todays recipe. Have a nice weekend! Plaintains are more starchier and pieces tend to stick together when making this preparation. Regular raw bananas are better. Looks delicious thoran,,, obviously all parts from banana plant is used in cooking.Nice recipe looks perfect.Hv a niz weekend, Sunitha. itrayum nannayi present cheytha oru vazhakka thoran ithu vavre kandittilla! spoon alla.kandappol bhangi thonni vangi. nice curry.... south indian recipes are so incomplete without coconut..
Banana coconut stir-fry! Never had it...very very interesting. Mmm.. stir-fry with banana and coconut sounds wonderful! Delicious and lovely pictures. Plantains that we get here are so hard that I end up steaming it in pressure cooker !! delicious thoran and very perfect too to go with rice. Love to gobble it up with some rice..
vazhakka-thoran nannyatu undu. Eniku eithinte koode sambar alla rasam kooti kazhikan anu thonnunthu. The curry looks fabulous! It does go well with the rice! What a simple and easy recipe Looks delicious. Love vazhaika curry. Looks awesome. I don't know that I've had raw banana yet, but I really want to try it... this looks tasty! This looks delicious, I've never had anything like it before. Atleast got 2 c ur awesome snap of it !! Wow, I love this idea. It seems very simple, extremely healthy, and also unique and full of flavor. Is this a traditional recipe, or something you came up with? I'm actually excited to try it, thanks for sharing! never tried banna curry usin coconut and garlic.sounds yummy. Very nice recipe..we eat lot of raw banana curry cooked in Bong style..this is new dish for me, will try certainly. This looks so good, it's something that I haven't had before. I love that. Yes! new things to try! another new dish... and i just want to tell you that i already tried your mung bean and it was raved by my family... we love anything with coconut, but this is something new as it's dry and not the creamy coconut one. Wow, I've noticed a couple of recipes around that involve garlic and banana. I have to admit that my palate can't imagine it, but banana is my favorite fruit. One of my favorite foods, so I'm going to try this. Thoran looks superb !! Missing my mom's version. We do also do in the similar way. Yummy click !! This is so lovely! I'd like to have it with rasam rice! Thoran looks delicious and yummy. Wonderful presentation. It looks delicious,simple but presented it beautifully.. I never knew raw banana can be used in this way. I only have tried banana with coconut in dessert. This is new to me. Hummm this is new for me, very nice recipe!! Definitely one of my fav recipe! But never took it to cooking at home, because once I did over steam the bananas. But seeing yours, I really would like to give another try. And what you said about this amazing plantain tree is true! use raw banana to prepare this dish, sound interesting! I don't think I've ever seen anything like this before, but coconut and banana sounds like an excellent flavor combination! You expand my bookmarked recipes list every time I come here! This sounds great! What a creative and delicious looking recipe! 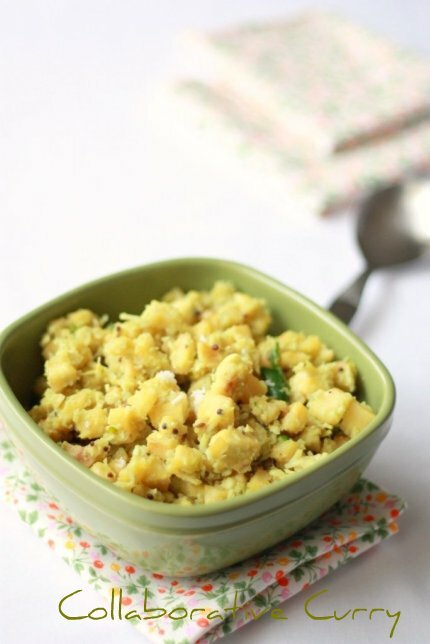 this is such a simple yet so flavorful dish! i have never had a raw banana side like this, but I so want to try now. thanks so much for the recipe. Sounds yummy! I will surely give it a try. This sounds really delicious and looks beautiful to boot! Do you have room for one more at your table for a little bowl of this banana heaven? simple and delicious recipe, looks good. I love how much I learn from you! This looks like another great dish! this looks great. we love raw banana dishes. here is another one to try.lovely click. Though we make raw banana curry in different form, this is new to me. Will try this out...Wonderful presentation. Lovely. Saw this on Flickr - had to comment. A beautiful and simple dish. this looks so delicious..too good. Simple and delicious....love vazhzkka in any form :). This looks absolutely lovely, guys! 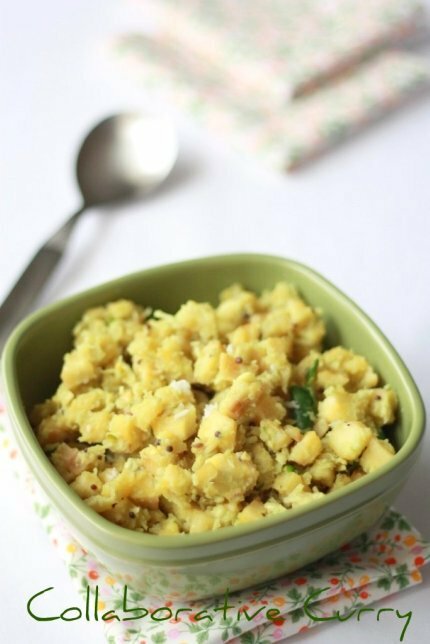 Flavorful thoran- the coconut oil should enhance the flavor!